Downtown Bellefontaine offers hundreds of on-street and public free parking areas. 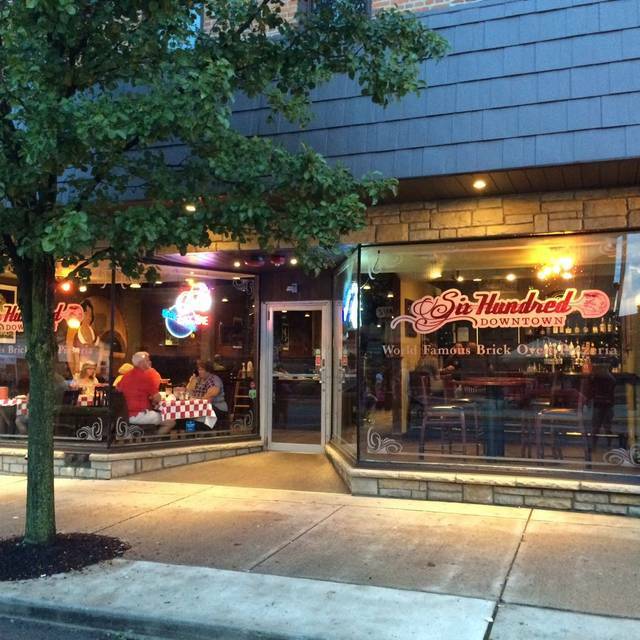 Six Hundred Downtown is a good old fashioned pizzeria, the way they used to be and they the way they were meant to be. We feel that pizza making is an art and we strive to create the best pizza we possibly can. We hand spin our pizzas the old fashioned way and we bake our pizzas in an old fashioned brick oven. Our famous pepperoni filled breadstix, rolled from our handmade dough and filled with Ohio pepperoni and whole milk mozzarella. Served with dipping sauce. Meant to be Shared! New Orleans - Award Winning! The Mad Hatter - Award Winning! Each pasta dinner includes 4 garlic knots and a small garden salad. Add any meat to your pasta for only $1.25. Our Pasta is made & baked to order so please allow a few extra minutes to bake to perfection! Best pizza and bread I’ve ever had. Me and my family come to eat at six hundred often thanks! We had a great time at 600. The food was excellent as always and they were able to seat our party of 11 without a problem because we made reservations in advance. The atmosphere is wonderful, and the entire staff was so friendly! THE FOOD WAS AMAZING!! I cannot wait to go back!!! Amazing pizza! From Columbus area. This pizza blows away anything I’ve had in Columbus! Fresh ingredients, unique crust selection, Beer selection, service, atmosphere is top notch! I do recommend an reservation. I will make the hour drive again. The food at this place is amazing! The cherry pecan salad was delicious. I added the grilled chicken. My husband got the sicilian bbq chicken pizza and pepperolis. They were phenomenal!! We took ALOT home! The portions are huge. Definately our favorite pizza place! Drove over an hour to have pizza and it did not disappoint. Plate of awesome was just that.....AWESOME! Tried four different pizzas and it was very difficult to pick our favorite. Definitely recommend The Montana, and BBQ Chicken. Our family really enjoys this place! Food is amazing! Amazing pizza, especially Detroit style! Definitely recommend. Food and Service are always excellent! The only issue this time was my reservation was for 6 adults and we were seated in a booth. It was a little cramped, but I know for future reservations. I am a fan of Six Hundred Downtown! Awesome pizza - haven’t been disappointed yet. Perperolis and Garlic Knots are a must have. Pizza was fresh, melty and delicious. Very crowded and noisy. Our server was overly busy. Took over 20 mins to get a bottle of beer. Had a great evening with good good and an awesome waiter. Food was great but service was poor. My parents and in laws were with us and it took 20 minutes to get a set of silverware. Appetizers took over 30 minutes to come out. It was very noisy and we struggled to hear each other. The benches were very uncomfortable to the point i just wanted to get out of there because my back hurt. I would go back for the food but not expect much for the service. I wouldn’t go with a group, we had six, and we were cramped into a bench style booth and couldn’t hear one another. Table in back was too close to door... cold where we sat. Great except for the loud mouthed lawyers sitting beside us. Their pizza is good, but it's so frustrating that because we can only get there on a weekend since we live over a half hour away that they never have the Detroit crust or Sicilian on hand. Sounds like poor management. Them having the waitress give us the schedule of how they make it and knowingly run out every weekend is ridiculous. Fantastic pizza! We go whenever we are in town. I've had many different versions and I really like them all. We used Open Table to book a table on a Saturday night. Walked in and table was ready with the restaurant full. Great food! Great Service! Took 5 minutes to be seated and service was slow, taste was great but took way to long. Ordered cannoli's to go took twenty min. to receive them. Also didn't have all menu items available very disappointing. We've been to Six Hundred numerous times. It's a 30 minute drive for us but it's one of our favorite pizza places so we make the trip about once a month. The last few times we've come something has changed. This time in particular, we made a reservation to make sure we got a table. When we got there at reservation time the hostess told us we needed to wait to allow the wait staff to "catch up". We waited about 15 minutes even though several tables were open. When we were finally waited on each interaction from the waitress was slower than the last. We waited to order drinks, then we waited to order food, then waited to order another drink, then waited for the check. They were out of the Detroit style pizza which was fine as we usually just order the regular crust in that case. The waitress talked us into order the Sicilian style. It came out dry crust and cold top. It was like eating a frozen pizza. Extremely disappointing for us. Sad as this was a special treat for us to travel to Bellefontaine once a month to go to the Brewfontaine and then for pizza. Hope it changes back to the way it was. Delicious pizza and the garlic knots were so good. Great little place! A must try - reset recommended....they get busy! We lived in Columbus for 30 years and moved to Indian Lake for a slower pace and simplicity. We do not care for the open table at all. It has taken away from the hometown feel and authenticity but more like Columbus because we have to make reservations . Otherwise we are told we have an hour wait but yet we see tables vacant only to be told they are reserved. We have several other couples our age which is 60’s who have found other restaurants . Your pizza is amazing but frustration is not what we want. Thank you. Had a great evening. Love the food, service was great. Worth the drive and love being on the patio!! Service was slow, garlic knots came out cool. Server gave excuse that there was a large carryout order that slowed the kitchen down, just our luck! Pizza was great, even though we couldn't have the Detroit crust we wanted since they were out. Server made it right on the knots, offered to send some home which we did not do so she took them off the bill. Appreciated that. Best pizza ever!! Sat outside in not ideal weather, but always prefer outdoors to in. Also we were on a time constraint so that’s not ideal when you order pizza. But it was well worth it. Made reservations through OpenTable on 06/09/18 for a party of 5 for 4 pm. When we arrived a few minutes early we were told we did not have a reservation. I showed my email confirmation and was seated at once. We ate and and left in just over an hour. On the way home I received a call from 600 Downtown inquiring if I planned to keep the reservation I had made earlier in the day. When I informed the young man that we already been there, had dinner and were on the way home, he sounded as if he doubted my word. Very irritating. Great food. Had Montana pizza and loved it. Only complaint is it is very noisy. Hard to have a conversation with friends. We went outside on patio to talk and that was a great spot. Overall, great experience. Great to be able to make reservations now! Always look forward to the Montana pizza. Delicious! Everyone ordered a personal sized pizza to their own preference. Our waiter was great. We all left happy and full. Thanks! Great food and service. Flavorful appetisers and pizzas. Accomodating with children. I had never been to this restaurant before but, trying to find a reservation for 9 people on Mother's Day for lunch was very difficult in the Columbus area. I saw this gem on Open Table and decided to give it a try. A short 45 minute drive....totally worth it. The pizza was so good and the Garlic Knots were Awesome! Our waitress (Melissa) was a pleasure and even recommended the Montana Pizza (which I would never have ordered without her encouraging) and Loved It!